William-Henry Ireland was nineteen years old in 1795 when he handed his father a document that he claimed was written and signed by William Shakespeare, and alluded to a trunk full of such documents that belonged to a mysterious Mr. H. by whom he was employed. His father, along with an impressive group of scholars, collectors, theatre-goers and the press, enthusiastically and uncritically accepted his claims as true. Encouraged by their credulousness, and beginning to believe his own ruse, William-Henry went on to produce many more signatures, letters, hand-written play scripts, sonnets, and even an entire play. 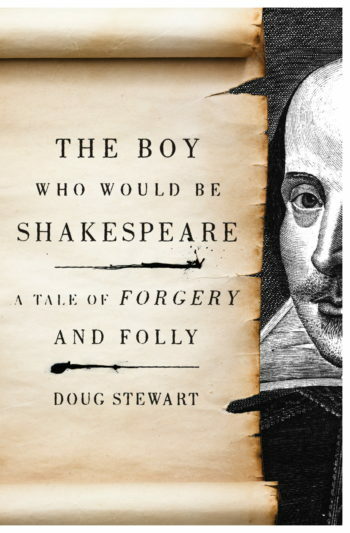 Doug Stewart’s The Boy Who Would Be Shakespeare takes us back to an era when Shakespeare’s work and art was a subject that was on everyone’s mind. The story of William-Henry Ireland’s spectacular rise and fall, it captures our fascination with Shakespeare, the cult of celebrity, and our willingness, even eagerness, to be duped when there’s an opportunity to get a little closer to greatness. An eminently readable and even suspenseful book…Along with the false discoveries, we are also treated to mini bios of a deliciously colorful nature…This new book acts as a kind of diorama of the times—letting us glimpse people’s behavior and their willingness to believe. [A] vivid dissection of the folly of human nature. Stewart’s exhaustively researched examination of the Irelands’ rise and fall is as entertaining as it is informative. …History and literary enthusiasts will be delighted with this smart investigation into a high-minded hoax. Stewart’s fascinating history recounts William-Henry’s short, frantic rise and fall, his brush with fame, and his subsequent lifelong infamy. … Stewart’s real achievement lies in how grippingly he tells William-Henry’s story, so that it climaxes in a disastrous premier of William-Henry’s faked ‘lost’ Shakespeare play Vortigern and Rowena at London’s famed Drury Lane Theatre in 1796 as well as in how much, by the end of the book, he has got us to care about the young, hapless fraud. A lively account of an adolescent prank that achieved a kind of preposterous grandeur. The story of Ireland’s output, and eventual confession (disbelieved by many as an attempt to save the reputation of his father, who was seen as the brains behind the operation) is epic.